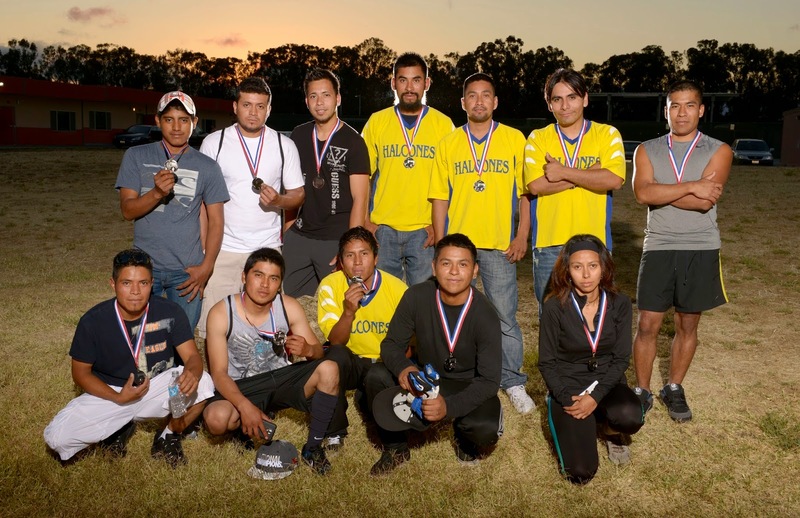 Every July, our school sponsors a soccer tournament for the students.The United States is just beginning to understand how REALLY popular soccer is on Planet Earth. I have been photographing the winning teams for several years now, and have pretty much settled into a "sun behind your back, show me your medals" mode that delivers satisfactory results every time. Truth be known, it's not a great time to get creative. You smile, make the shot, and move on. In this case, the player at the far left dropped in at the last minute, setting the composition a little off kilter. Lighting was pretty straight forward. I used the same two Quantum X heads powered by a Norman 200B Battery Packs as I do when making the big group shot at graduation. Because the soccer teams are much smaller, one frontal light is sufficient, which allows me to use the second as an accent light from behind. I use a pair of Eilenchrome Skyport radio flash triggers, one for each head. 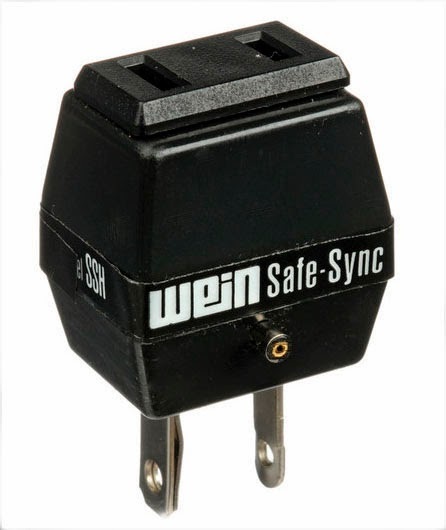 I install a Wein Safe Sync SSH into the "H" receptor in the flash head to protect the Eilenchrome of the high trigger voltages associated with the Normans. Notice that the Safe Sync can be used with an "H" connector (sometimes called an AC connector because it looks like an appliance cord) or a PC connector, which you can see in Photo #2. Redundant Flash Triggering. When I use two Norman/Quantum units together, I install a standard optical slave in the H connection port and a PC to Microphone cable between the PC port of the Safe-Sync and the Eilenchrome. You can see the setup here (Photo #3). The orange optical slave (discontinued Normans) is seen in the H connector. The Skyport is hanging from its own strap which takes the strain off of the PC/Microphone cable. With two identically equipped heads, they can be triggered by the Skyport transmitter on my camera's hotshoe, or by another flash. You have to be careful, because ANY flash from any camera will set them off, so when working indoors with other photographers, this may not be a good idea. But when working alone, it gives me a additional measure of reliability. As you can see, I'm using an unmodified reflector. Given the nature of the photo, it's better to not get too creative. Also, a slight breeze could knock the light stand over, potentially ruining your day. In this not-so-great photo(Photo #4), you can see the second accent light facing directly into the camera. You can get an idea of where the edge of the light falls. That grey box at the base of the stand is the Norman B200 battery pack secured to the stand by a Norman quick release bracket. In most cases, this is all the ballast I really need. When setting up the shot, I decided what portion of the sky I wanted as a background. There obviously wasn't much to choose from, and by the time I actually photographed the teams, most of the clouds had blown elsewhere. 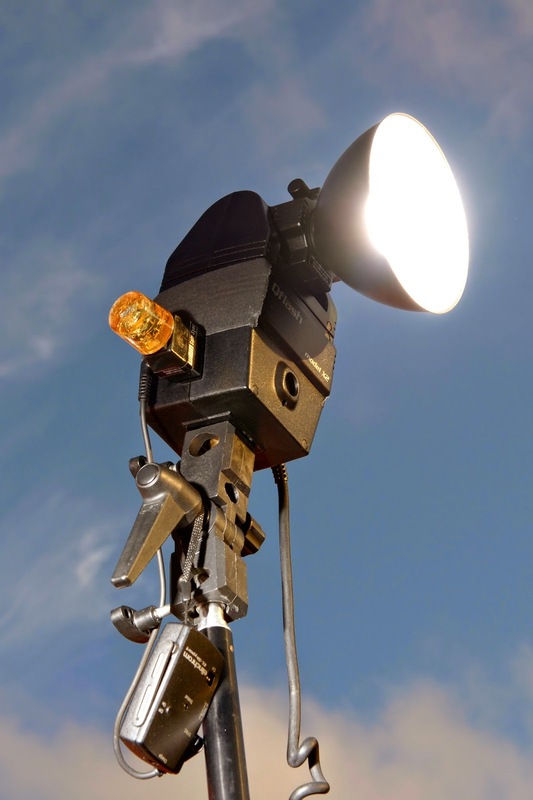 Once I established my shooting position, I place my key light high and behind me. Next, I walked away from the key light towards the background and placed the accent light about 12 feet from where the team would be posing , and rotated the head to face forward. 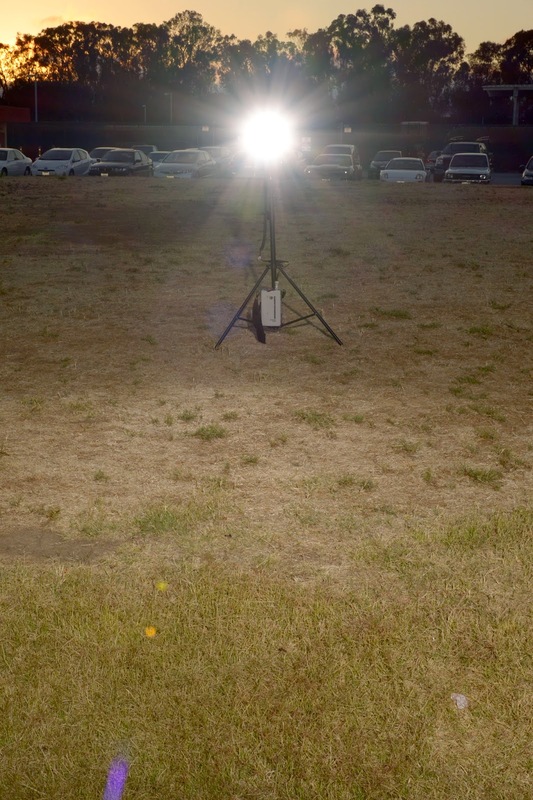 The light was set at a height of about five feet off the ground. Finally, I turned to face the key light, and walked to the mid point between my two strobes, and placed a penny on the ground. This marked the point where I would place my tallest player, since I would need his height to shield the accent light. Woulda, Coulda, Shoulda: Every photo has one. I wished I had thought to add a full Color Temperature Orange (CTO) to the accent light. That would have given the illusion of the setting sun in the background. But even as it stands, most viewers had assumed it was natural sunlight, and really liked the effect.